D.C. Charters Have Some Of The Highest Salaries For Administrators. So Why Are Their Teachers Making So Little? D.C. has gained national recognition for its above-average teaching salaries. From 2016-2017, the average D.C. public school teacher earned just over $76,400. But, at the District’s charter schools, the average salary is about sixteen thousand dollars less. So, what is causing this disparity? And why are charter administrators pulling in some of the highest school salaries in Washington? KOJO NNAMDIWelcome back. DC is nationally recognized for its above-average teaching salaries. From 2016 to 2017, the average DC public school teacher earned just over $76,400 a year. But at DC's charter schools, the average salary is about $16,000 less. So, what are the reasons behind this disparity, and why are chartered administrators still pulling in some of the highest school salaries in Washington? Joining me in studio to discuss this is Jennie Tomlinson. She's a school librarian and technology specialist at Cesar Chavez Public Charter School at Chavez Prep Middle School. Jennie Tomlinson, thank you for joining us. JENNIE TOMLINSONThank you for having me. NNAMDIIrene Holtzman is executive director of Friends of Choice in Urban Schools, or FOCUS. Irene Holtzman, thank you for joining us. NNAMDIAnd Rachel Cohen is a contributing writer at the Intercept. She freelances for Washington City Paper and City Lab, among others. Rachel, good to see you. NNAMDIThere's been a national focus, Rachel, on teacher pay, over the last year. What did you find in your reporting on DC's charter school salaries for Washington City Paper? COHENWell, when I first started to look at salaries for DC charter schools, I was surprised to find there was not actually that much information available, especially compared to DC public schools. What we were -- what you can glean from sort of looking at annual reports is that DC charter school teachers make significantly less than DC public school teachers. But that level of information, and Jennie, I'm sure, can talk a little bit more about that. Uh, it can be hard for not only taxpayers to figure out what the teachers are earning, but for the teachers themselves in the school, it can be hard to sort of make financial plans for themselves or figure out what schools they could be working at where they could make more money based, on their levels of experience and potentials. COHENBecause the information is not publicly available. And even if you work in the school you can't get it. Charter schools are not subject to the Freedom of Information Act in DC, and they do not, you know, make that information public. NNAMDIBut, in general, you seemed to find that charter school teachers tend to make an average significantly less than their public school counterparts. COHENYeah. So, what information we do have is that charter schools are asked on their annual reports to publish their minimum, maximum and average teacher salary. They're not required to do that, so not all schools do, but most do. And Mary Levy, an independent budget analyst, you know, and she was working on a different report for the state board of education on teacher attrition. COHENSo, she compiled a spreadsheet and was able to tabulate the estimated average salary in 2016 and 2017. But she cautioned that we should still be a little skeptical of those figures, because for her report -- which was focused on teacher attrition -- a lot of schools that reported over 50 percent attrition on their annual reports actually had less than 50 percent attrition, and had kind of mixed up retention and attrition. And she was saying, you know, sometimes the data on these annual reports -- because they're not really crosschecked by anybody and there's no real penalty for messing it up -- you know, that's sort of the best we have right now available to us, but it's certainly not the best that we could have. NNAMDIA lot of public school teachers have years of teaching under their belts, some of them teaching for decades. By contrast, many charter schools are quite new and their teachers often young. Did your salary research take into account differences in experiences and experience in years on the job? COHENYeah, well so, you know, a lot of people asked me, well, why would a teacher work at a charter school if they could get more money in DC public schools or elsewhere? And, you know, there's a lot of different answers for that. Jennie, I'm sure, can also talk about that. But it can be easier to get started in a charter school. The credentialing and licensing process is a little different. Maybe they're attracted to the school's mission or they fall in love with the students. And also if you're in your 20s, which a lot of charter school teachers are, the lower comparative teacher salaries are often still attractive to draw in teachers of those ages. It's usually when you get older and you're looking to start a family and have kids that those differences start to make real differences. NNAMDIJennie, what's been your experience? TOMLINSONSure. So, I started my teaching career in the public school system, but I have been working at Chavez Prep in DC. This is my sixth year at this school, and I'm one of the most veteran teachers at that school. And like Rachel was saying, there are a lot of reasons why someone would choose to work at a charter school. And it's not always about the salary. Like, most of the time, it's because the educator, even if they could get paid more somewhere else, they believe in the school's mission, they're attached to the school community, to the students. TOMLINSONSo, a lot of the teachers at my school have chosen to continue working there, turned down other job offers from other districts from other schools because they're loyal to that school. They're attached to the students at that school. NNAMDIIrene Holtzman, what do you make of this reporting around teacher salaries, and what might account for the differences? HOLTZMANSo, there's a couple of things. For both traditional public schools and public charter schools, teacher salaries are the largest driver of their budgets. On the charter school side -- well, on both sides, schools are funded through what they call the uniform per student funding formula, so that the money follows the student to the school. And the intention was for both sectors to be funded equitably. Unfortunately, on the charter side, there's some buckets of funding that go to DCPS outside that formula. And one of them, which is really large, is related to teacher compensation. HOLTZMANSo, for FY18, DCPS received $59 million outside of the formula to fund the teacher pension. In charter schools, that money comes out of the UPSFF. In addition, because they're not part of the pension, they also pay the social security tax, which is 6.5 percent. My husband's a charter school teacher, and he has a pretty decent match on his 403B. HOLTZMANAnd so looking at the confluence of the social security tax and the pension requirement and the 403B contribution, you're looking at about a 10 percent premium just on their benefits, which is not to say that charter schools really want to recruit and hire and retain the most effective teachers they can. The penalty for not educating their children is really steep, because they're measured on outcomes. And so if you look at any charter school's budget, you'll see the vast majority of their funds go to compensating their teachers. NNAMDIRachel, teacher salaries at local charters, as we said, tend to lag behind traditional public schools, but not salaries of top administrators. What did you find there? COHENSo, if you look at the nonprofit tax filings that charter schools have to file every year, they post their top five highest-paid administrators. And so if you go through those, you know, you can see -- well, you see a couple trends. I mean, A, the salaries have gone up, and B, you have some really notable outliers of charter school administrators earning -- you know, we talked in our story about one CEO who took home $541,000 in 2017 for a charter network of 2,000 students. One of the points that we were talking about post-article publication is it can be sort of helpful to think about this in terms of the school's size. So, Lewis Ferebee -- who's likely going to be the next DCPS school chancellor -- he's likely to earn $280,000 for a school district of 49,000 students. That's $5.70 per student. COHENYou know, the executive director of Thurgood Marshall Academy took home $180,00 in 2007 for a school of 383 students. So, that's $469 per pupil. So, you know, putting out these figures for people to talk about and, you know, no one in the world is ever going to say they're paid too much. That never happens, like, but, you know, I think it is important to have a conversation in the city about, well, how many more times more should a charter school executive be making than their teachers? Is two times appropriate? Is three times, four times, five times more than their teachers? And, you know, you could say, oh, just pay everyone more. Everyone should make more money. But I think having a more real conversation is useful. NNAMDISpeaking of a real conversation, Irene, what do you think accounts for the higher administrative salaries at charter schools? NNAMDII was about to say, what's the difference between the job that a DC school principal has to do and the job that a charter school administrator has to do? HOLTZMANI have a great list in a blog I wrote. But, really, a principal's hired to be the instructional cultural leader of a school and manage a school's budget. When we look at the most highly compensated CEOs in public charter schools, we're looking at folks who are responsible of managing budgets of 20 million, 80 million, in one case, a $130 million. HOLTZMANAnd so, when we think about nonprofit compensation and the way that nonprofits compete for talent, the PNP Staffing Group does a really great study about, like, what does CEO compensation look like in regards to the size of a nonprofit's budget. And every single one of those people falls into those 40th percentile bands. And so, I would say again, when you look at those budgets, the vast majority of the money in the schools goes to compensating teachers, not the CEO. NNAMDIRachel, you ran into issues finding information about local charter schools, which currently are not required to report salaries. As it happens, the public charter school board, which oversees charters, is considering requiring charters to make more information public. What are they debating? COHENYeah, I'm glad you brought this up. This has been a growing conversation in DC. It's something I've been reporting on for the past couple of years. The public charter school board is currently taking public comment for transparency reforms. A number of teachers -- including Jennie, actually --testified at their last public meeting. Washington, DC is one of the only cities in the country -- cities and state in the country that does not require their charter schools to be subject to FOIA and Open Meetings Act. COHENLast night, Perry Stein of the Washington Post published an article on this topic, where they featured the head of the National Alliance of Public Charter Schools, which is sort of the national charter school advocacy organization, saying that DC was an anomaly. So, there's a growing movement. Teachers have been organizing a petition. They're asking the charter school board to go further and accept these reforms. One of the reasons that they -- one of the responses has been, oh, well, we worry that charter schools are going to be really burdened, and they don't have the administrative capacity. COHENEven as we're sitting here discussing whether the administrative salaries are, you know, justified, there's been this concern that if we ask charter schools to be subject to the same level of transparency as other public institutions, they won't be able to handle it. What I would say to that is we've never seen any evidence that schools would be so flooded with FOIA requests or unable to handle, you know, basic public accountability in that way. And, in fact, the fact that New York, Connecticut, North Carolina, South Carolina, Florida, Ohio, Texas, Illinois, Colorado and other cities and states with thriving charter sectors, you know, exist while also having Open Meeting Acts and FOIA transparency. NNAMDILet's ask Marcus Batchelor about this. He's vice president of DC's State Board of Education. He joins us by phone. Marcus Batchelor, thank you for joining us. MARCUS BATCHELORThanks for having me, Kojo. NNAMDICharter schools were created specifically to be independent of the traditional public school system. So, what kind of oversight does the State Board of Education exercise over charter schools? BATCHELORSo, generally, the state board's authority is very narrow, but all of the policies, the standards that we pass affect both sectors of the system. And our sister agency, the Office of the State Superintendent, is charged with holding both sectors accountable to the standards that the board approves. NNAMDIDo you think public charter schools should operate more like traditional public schools and make public information about things like salaries and budget? BATCHELORYes. And I think generally -- and this is a conversation that residents of the District have had for the past two years or so, I think, since, you know, you covered and the City Paper has covered kind of the bottom falling out on a lot of narratives, and an increased call by families in our community around transparency. So, just like, I think, you know, where, you know, there's an active conversation with DCPS about more transparency around the spending of that risk funding, there's an increased conversation with our charter partners about residents having the information about how they're spending public dollars, right. BATCHELORI truly believe that every dollar spent by a school is an investment in students. And families deserve to have access to how schools are investing in students. And we deserve to have a full and honest conversation with all the information that we need about how we can better invest in students and student outcomes. NNAMDIMarcus Batchelor, thank you so much for joining us. Marcus is vice president of DC's State Board of Education. Marcus Batchelor, thank you for joining us. NNAMDIThese charter schools are overseen by the Public Charter School Board, but they were unable to make a representative available for today's show, so, well, it's on you, Ilene. (laugh) We've been discussing the proposal to require charter campuses to post more data and information on their websites. Some parents and teachers are saying the proposal doesn't go far enough, arguing that charters should be subject to public information and open meeting laws. So, what about the transparency piece, Irene? Charters are independent, but they're also publicly funded. How much information should charters be required to share? HOLTZMANI have a couple of points to make on the answer to that. I think the first one is that I worked in charter school compliance for eight out of my 15 years in public schools, and turned over nearly six three-ring three-inch binders to the Public Charter School Board before the era of submitting it online. And there's a ton of stuff that PCSB collects, and they're FOIA-able. And so, the question about whether or not they have enough information or the right kind of information, that's the conversation which we should be having. Right now, budgets, 990s, school performance reports, all kinds of things are available on the PCSB website. And if the public feels moving them to the school websites is a good move, I don't have any objection to that. NNAMDIJennie, you're a school librarian and technology specialist at Chavez Prep Middle School, which also happens to be the only unionized charter in the District. When you heard about some of these administrator salaries, how did you feel? TOMLINSONWell, some of the numbers in the article were pretty shocking to me, but as a member of the only unionized charter school in the District and as a member of my school's bargaining team, I had a little bit more insight into charter school finances than probably any other charter staff member in the district, because as part of the collective bargaining process, our union has the right to examine the financials of our charter school. So, I wasn't really surprised about the high administrative costs. At my school, for example, we found that between 2013 and 2017, administrative and business expenses increased by 36 percent. And expenses on student-facing services only increased by 2 percent during that same time period. NNAMDIWell, Chavez Prep will be closing next year. How have students, parents, faculty and staff responded to this news? TOMLINSONI mean, frankly, we're devastated. Our school community is devastated. We found out about it -- actually, we were tipped off by a reporter that it was happening, and about ten minutes later, we were called into a meeting where our CEO told us that this decision was made. And this issue of transparency is very personally important to me, because if decision-making in charter schools was more transparent, then the stakeholders in my school, the parents, the students and the staff would've been part of these conversations. They wouldn't have taken place in closed meetings, behind closed doors. I wish that our school had involved all stakeholders in this decision-making process. NNAMDISo, what's next for Chavez, and for you? TOMLINSONWell, the focus of the staff at my school right now is making sure that all of our students have a school to attend next year. Our eighth graders had to scramble to fill out the My School DC application before February 1st, which was the deadline. And middle school students have until March 1st to complete their application. So, we're doing everything that we can to help students and parents find schools for next year. It's been a challenging, difficult process. That's our first priority. Second priority is going to be looking for a new job next year. 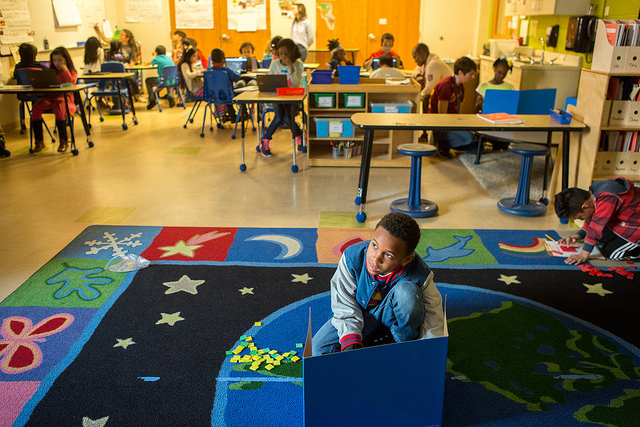 NNAMDIWell, Irene, nearly half of DC's public schoolers are enrolled in charter schools. Since 2014, the DC Association of Charter Public Schools has argued -- as you have mentioned here -- that it does not receive equal funding. What is the current status of the lawsuit that was filed by the Association of Charter Public Schools against the District? HOLTZMANSo, there was a decision late last summer, and one of the issues wasn't ruled on. One of them, they found that the District does fund the sectors inequitably, but also that it has the right to, which I think charter school parents and students and anyone who works for one said that all students are equally valuable, and all schools should be equally valued. So, the association and the plaintiffs chose to appeal that decision. Oral argument happened earlier this fall, and we're waiting on a decision on the appeal. NNAMDIAnd, finally, Rachel Cohen, do you know if the DC Public Charter School Board is going to take up the issue of transparency? COHENThey are taking it up right now, and they are accepting public comment. And I would encourage anyone who has an opinion on this issue to submit one. NNAMDIRachel Cohen is a contributing writer at the Intercept. She freelances for Washington City Paper and City Lab, among others. Thank you for joining us. NNAMDIIrene Holtzman is executive director of Friends of Choice in Urban Schools, or FOCUS. Irene, thank you for joining us. NNAMDIAnd Jennie Tomlinson is a school librarian and technology specialist at Cesar Chavez Public Charter School at Chavez Prep Middle School, the future of which, at this point, is uncertain. NNAMDIThank you for joining us, and good luck to you. That's all for today's show. Our segment on the District's straw ban was produced by Monna Kashfi. And our segment on charter schools was produced by Julie Depenbrock. Join us back here tomorrow. We'll be checking in on an exhibit at the National Gallery featuring the work of photographer Gordon Parks, who captured images in the District in the 1940s. Plus, the Newseum announced that they're selling their prime downtown building and searching for a new home. We'll take a look at how private museums fare in a region with so many free and public ones. That all starts tomorrow at noon. Until then, thank you for listening. I'm Kojo Nnamdi.